Rescue horse Sandy (left) noses in for some attention from Melissa Jandreau at Hill Top Farms. Sandy is one of several rescue animals living the good life on the Frenchville farm. It’s a bit tricky to differentiate which animals are the rescues and which are the livestock at Hill Top Farms in Frenchville. Sure, there are the typical for-food animals one expects to see on a small diversified family farm in northern Maine. Some beef cows, dairy cows, pigs and laying hens. Then there are the misfits, as Melissa Jandreau calls them. A collection of critters that, for one reason or another, no one else wanted. Jandreau owns and operates Hill Top Farms with her longtime partner Adam Dube, who is a truck driver by day and runs a slaughter house on a part-time basis. The two boys, Emmett, 4, and Oliver, 2, also are learning about compassion when it comes to raising animals, thanks to their parents’ rescue work. There are retired show horses Jake and Sandy who arrived after their previous owner was too overwhelmed to care for them. There’s also Goldie, a 20-year-old Tennessee Walker horse that Jandreau discovered when she was in such poor health and underweight that veterinarians have said she will never fully recover. 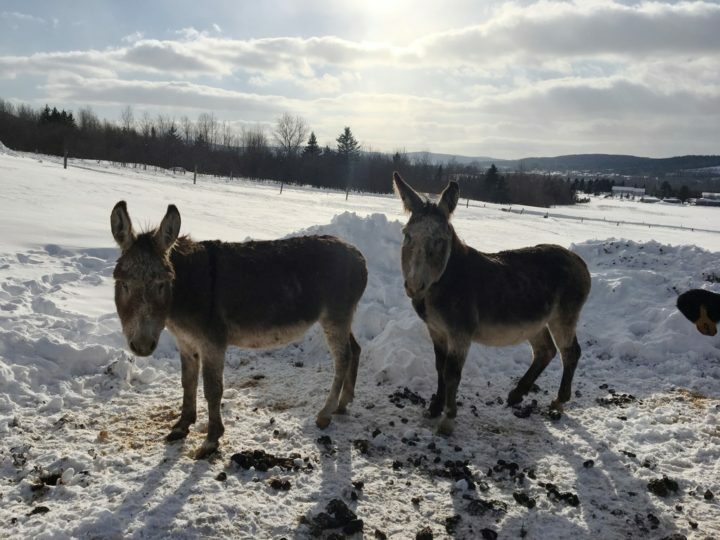 Rescued donkeys Grace and Norman have found a happy, peaceful life at Hill Top Farms in Frenchville. Happy to hang out with the three horses but very shy around people are the two rescue donkeys, Norman and Alice. Never far from their sides are Moo Cow, Swiss Cheese and Big Mama — a highland cross, a Brown Swiss bull and a Hereford-Angus cross, respectively. Inside the small barn, potbellied pig Gordie hangs out with Wilma the dairy cow, who is recovering from a foot injury. The Idaho Pasture Pigs are allowed to free range within the fenced-in areas of the farm while the newer, prized pork-producing Mangalitsa pigs are spending the winter in a cozy stall in the barn. There are also a half-dozen sheep, two mini-horses, three dogs, two guinea pigs and two cats. 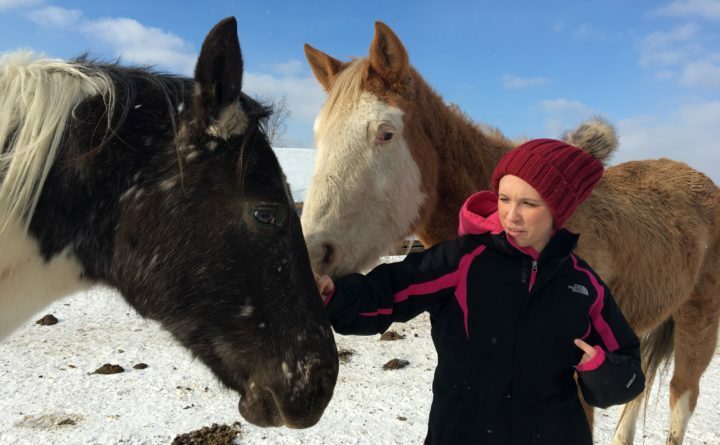 Jandreau said they were not looking for horses when they learned about Jake and Sandy, but once they heard their story there was no way they weren’t getting them. So the two horses, plus all their tack, came to Frenchville, where 7-year-old Sandy immediately took over. Sandy, it turns out, also has a kind of a tell, according to Jandreau. Jake, who is 16, is quite friendly but seemed content to let Sandy monopolize the spotlight. Goldie, Jandreau said, was another acquisition made when looking for other farm animals. That’s all Jandreau and Dube needed to hear and they spent the next year dealing with Goldie’s multiple infections and severe infestations of parasites. 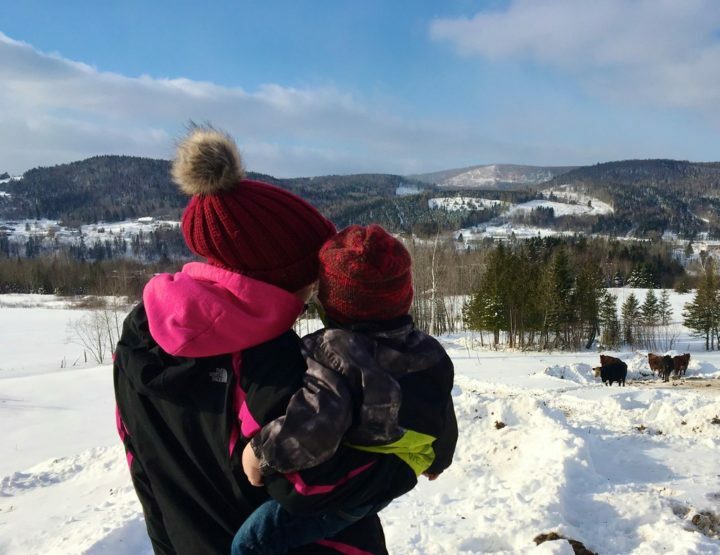 Melissa Jandreau holds her son 2-year-old Oliver as the two look out over Hill Top Farms in Frenchville. Jandreau and Dube were on their way to pick up a cow in southern Maine a year ago when they found Norma and Grace, Jandreau said. It was on a trip to pick up some pigs that Moo Cow joined the farm. Jandreau ended up bottle feeding the malnourished animal and now, a year later, Moo Cow is healthy and a permanent member of the family. Hill Top Farms covers 300 acres and Jandreau hopes to see it grow from the current 40 beef and dairy cows and half-dozen pigs. She’s under no illusion how much work that plus raising two boys will be. Dube, she said, is a fourth-generation farmer who grew up raising animals for food. Jandreau’s maternal grandparents farmed but she said her mother wanted nothing to do with that life. When Dube is on the road trucking, Jandreau travels the mile or so from their house to the barn and pastures where the animals are housed to feed, water and check in on them. This year for Christmas Emmett and Oliver each got their own cow and Emmett is already talking about plans to breed it and sell the offspring, Jandreau said. And while Oliver enjoys petting his own new cow, Jandreau pointed out his limited vocabulary makes it a bit difficult to know his plans. To be a farmer, she said, means dealing with everything that comes along, whether it’s slaughtering an animal you have raised from a baby or nursing a sick critter. The couple started giving the calf medications to help it and ended up moving it into their kitchen so they could watch it and bottle feed it. When the calf started to improve, Jandreau said they moved it out to their sun porch where it stayed for a week until it was well enough to move back to the barn. But that’s just part of farming, she said. But it’s the life she and Dube have chosen.